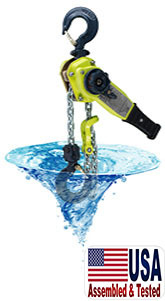 The AMH X5 series lever hoist is one of the most advanced and capable lever hoist on the market today, and is completely submergible. They offer a wider range of capacities and are assembled and tested in America! Meets: OSHA, ASME B30.21 and ASME HST-3. In addition the ultimate strength is 5 times Work Load Limit (WLL) meeting structural requirements of ASME HST-3 Appendix A, for use in marine and other applications as specified by US Department of Defense DOD.